When you buy the new Microsoft Surface Pro 3 you are buying the convenience of tablets combined with the power of a laptop, making the Pro 3 an extremely versatile device. *Models vary in the Surface Pro 3 range. Large touchscreen - The 12-inch display encased in a sleek magnesium frame makes the Surface Pro the thinnest and lightest in Microsoft Surface range. Front and rear cameras - The tablet includes a 5MP camera at the front and 5MP camera on the rear that are perfect for conferences, Skype calls and more. App snapping - Now you can run two apps simultaneously, with one app occupying two-thirds of the screen and the second app occupying the remaining third. 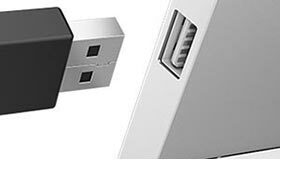 Range of ports - The Microsoft Surface includes a full-size USB 3.0, microSD card reader, headset jack and mini display port that is perfect for connecting your Surface Pro to a monitor or television. Superior processors - The Microsoft Surface range offers the Intel Core i3, i5, and i7 for super fast performance and multi-tasking. Surface pen - Included with the Microsoft Surface the pen enables you to sketch, draw, take notes and more on your Surface Pro display. Palm block technology means you can rest your hand on the screen without leaving a mark or disrupting tasks. 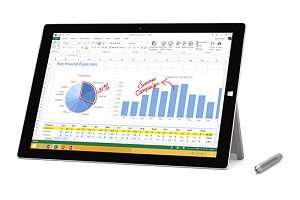 Multi-positioning kickstand - Enjoy the best viewing angle with the versatile Microsoft Surface kickstand. Fantastic storage - You will have ample space for music, movies, pictures and more on your Surface Pro 3 with size options ranging from 64GB to 256GB. 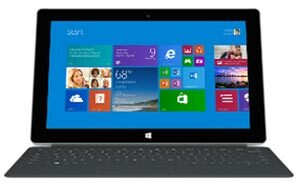 The Microsoft Surface Pro 3 is ideal for professionals, students, and corporate executives who needs their portable computer to execute a wide range of functions at high speeds with power of a laptop and the portability of a tablet. The Microsoft Surface 2 is capable of much more than standard tablets. When you purchase a Microsoft Surface 2 you buy a tablet that is ready to go thanks to preloaded Windows RT 8.1 and excellent software like Microsoft Office 2013 RT. Power and pizzazz - Surface 2 has the substance to tackle tasks with the speed and power of a laptop thanks largely to its NVIDIA Tegra 4 processor chip and 2GB RAM. App-snapping - Run two apps simultaneously thanks to app snapping. Send emails whilst taking a Skype call; listen to music whilst gaming, the options are endless. Front and rear cameras - 3.5 megapixel camera on the front and 5 megapixel camera on the rear make the Surface 2 fantastic for Skype conversations with versatility. Various ports - transfer files with speed, connect accessories and utilise the Surface 2's visuals with a full size USB 3.0 port, HD video out port and microSD card reader that can increase the potential storage capacity of your Surface. Visuals - The 10.6" display sparkles in full 1080p High Definition making the tablet ideal for watching movies, TV shows, gaming and video Skype calls. Practicality - an updated, integrated dual position kickstand can be adjusted to two separate positions for an optimal viewing or typing angle. Accessories - new touch and type keyboards are backlit for working in all light conditions; Wireless adapter for the keyboard so you can operate your Surface 2 wirelessly. The Microsoft Surface 2 is ideal for anyone looking for a general use tablet with the latest technology; who wants to enjoy movies, TV shows, music and Skype chats on their tablet, and multi-taskers who enjoy touch-screen operation.